My 1972 model 28 - the first of the Babettas. I have recently bought this moped off eBay. It is complete and very original having been owned by the same family from new and has been unused since 1986. It is “on the list” for a sympathetic restoration. The following is a little of the Babetta story written by our good friend from Berlin, Edgar Uher who had visited the factory many times during his time as the German importer of the machines during the 1990's. The information contained in this article was compiled with the assistance of Jan Sujansky, a long-time service engineer of Babetta who lives in Povazska Bystrica and who worked for many years in Kolarovo. Way back in 1928 a Slovak engineer with the name of Roth, who owned ammunition factories in Bratislava and Brno, founded a further ammunitions factory in the northern Slovak town of Povazska Bystrica under the name of Ceske Municne a Korodelne Zavody Brno, factory 2. After the second World War in 1948 this factory got a new name. A name that it has kept to this very day - "Povazske Strojarne", from now on in this article just referred to as PS. (Povazska from the town and Strojarne - from machine building). As weapon production after the war decreased, PS looked for alternative products to produce, and it chose to start manufacturing motorcycles. As we know it has not been the only factory to go straight from arms production into motorcycle production; JAWA had previously done the very same thing and it was JAWA that PS went into co-operation with. Out of this co-operation soon came an interesting bike. The Manet 90, a machine with a single cylinder engine employing a double piston on one con rod [Split-Single]. Soon after in 1955 small scooter called the Pioneer 50 with a 3 speed gearbox also came out, to be shortly followed by Pioneer 550, 555, JAWA 20 and 21 as well as the Mustang, all of them with 50cc engines. The Pioneer 555 was even manufactured under license in India and Egypt. Bike production at PS was however not limited to just 50cc models, with from 1956 scooters with l00cc and 125cc engines leaving the factory under the name of Manet S-100 and Tatran 125. Destination: Hungary, Bulgaria, Romania and East Germany. It is interesting that the name Manet, is derived from the Manin mountains which are visible from the factory. It was also a name that figured on some refrigerators that were made at that time. In 1972 using the name JAWA, the bikes with a 90cc disc valve engine won many prizes while taking part in the ISDT which took place that year in the United States. This success made the machines virtually famous over night, and created healthy export orders for Jawa 90, Jawa 90 Cross and Roadsters. These models while having been developed by JAWA in Prague, were manufactured by PS. Not only were these little machines a great success in the USA, but the German catalogue firm Neckermann also became interested and started importing them. This however is another story, to be told possibly at some other time. 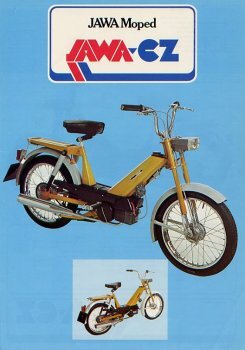 In the second half of the 1960s the Czechoslovak export/import company for automotive products, Motokov who were the sole exporter for JAWA and the bikes from PS, saw a possible market for a small, robust and easy to handle bike, which in some countries would not need a driving license. Something like the French Solex which at that time was selling extremely well. PS produced 2 samples for development purposes. The first type bore a close resemblance to the Solex. It was however disliked by both PS and Motokov and the project was soon scrapped. The second type was more successful, but it too did not meet the demand of the market, notably the then very large Dutch market and that too was soon stopped. 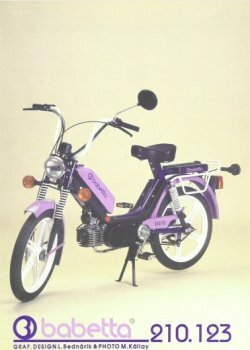 As a result of these failures, Motokov soon lost interest in these small bikes from PS, they argued that there was after all an insufficient market. PS however did not agree, they did see a market and so continued with their development work, aiming to produce a machine especially for the then lucrative Dutch and German market. This market demanded pedal gear and large wheels as legislation favoured bicycle like motor vehicles. Babetta went into the world. Two designers, G. Ulicky and J. Safarík were set the task and soon came up with 2 versions of a new bike, one with large 23" wheels, the other with smaller 16" ones. 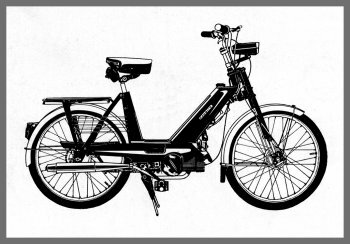 The export demand initially was for the larger wheel version, so, production of a moped called the type 28 started with this configuration. There was an initial batch of 100 units made in 1970 for testing and marketing, and in the spring of 1971 series production started. This bike had no rear suspension, but did have a contact less transistorised ignition system housed in a bright red box (it was called Transimo). This was at that time a world first, as up until then electronic ignition, had only been known on cars. The type 28 represented a totally new generation of bikes manufactured by PS and they decided that a new model name other than JAWA was required. It so happens that by then co-operation with Jawa had in fact ended, and they didn't wish to use the Manet name which was associated with scooters. Finding a good trade name is not an easy job, but it so happened, there was at that time a very popular song in Czechoslovakia that went "Babetta sla do sveta", which translates to "Babetta (a girls name) went into the world". This seemed well suited for the intention to produce a bike that should go out to the worlds markets. In 1975, PS redesigned the rear part of the moped, giving it rear suspension units. This Babetta type 207 was so successful that in 1976 all 100% of the production was exported. Germany alone (West Germany) taking some 20,000 mopeds, sold there by the catalogue firm Quelle. To this very day many of these moped are still on the road, some even with the original Transimo ignition units. At long last, Motokov saw the error of their earlier decision and gave a "Green-Light" for further developments in design and technical improvement. Within a very short time PS had created many more types: 207-200, 207-300, 207-400, 207-500, for different customer markets, (eg) for Germany and the Netherlands a special 25km/h max speed version and for the US a 30km/h version, the version for the home market was capable of 40km/h. There was also a two-seater version together with a sports type. Though sales were really good at the end of the 70s, PS and Motokov knew that nothing lasts for ever, so the search for a new type model was on. It was 1983 when a new model saw the light of day, the model 210. This was based on the proven concept of the 207, but there was a totally new design and a modified engine fitted with an automatic 2-speed gearbox. This second speed gave the engine a third set of clutches, a headache to many a man who sets out to repair the engine. One clutch was for the pedal start, a further for starting vehicle movement and the third for gear changes at certain speeds. For the Dutch market the single speed version was still preferred and so production continued. Different versions were capable of reaching speeds from 25 to 50 km/h. although with a little tuning they were easily capable of speeds of well over 60 km/h (38 mph). PS had at that time some 13,500 employees, of which 3,500 were employed making mopeds (the rest manufactured mainly weapons and large bearings for turn cranes). Large as it was, PS was only part of an even larger company, called ZVL, a huge ball bearing manufacturer in Slovakia with some 64,000 employees. With the then Cold War still very prominent, ZVL were given the task of producing military aircraft engines. Production of these engines needed extra space and with the capacity of the northern Slovak factory full, the moped production had to move elsewhere. And so it was that at the end of 1985 PS took the decision to stop development and production of two-wheelers at Povazska Bystrica, and to relocate production to a new replacement factory constructed in an unlikely rural place called Kolarovo. Kolarovo is not far from the Hungarian border and inhabited mainly by Hungarian speaking people who traditionally had earned their living mainly in agriculture. The intention of putting the factory at this location was to help industrialise that area and to also subdue the possibility of any unrest from the ethnic Hungarian minority. In 1986, production of moped type 210 was moved to this rural branch plant. The new Kolarovo factory with no experience of bike construction, received all the transferred production equipment from Povazska Bystrica, including testing equipment and the technical documentation needed to make the mopeds. Still it is reported that the people at Kolarovo complained that they had received from PS only their old equipment and technology. During most of 1986 there was daily contacts between Kolarovo and Povazska Bystrica over development, production and testing. Many PS personnel were temporarily posted to Kolarovo to assist production, but by the end of 1986 they all went home and most of the contacts ended. Kolarovo was now completely on its own. Still, production of mopeds of type 210 continued and was even widened over the following years. There had been 210 mini, 210 lux, 210-008, 210-011, 210-012, 210-021, 210-025, 210-041, 213, 215, 225, 226, 228. All of these had been based on the trusted 210 model. Production sometimes exceeded 100,000 units a year and all initially seemed to be going well -- I said seemed! With the political and economic changes after the collapse of the socialist economies in 1990 Kolarovo too was facing stark realities. Having been privatised, it soon lacked the funding of the state, though that had actually been scarce during the 1980s already. Prices for energy and materials rose, formerly reserved markets in Hungary and other ex-communist states opened up to new products, rejecting now the Slovak make. With Czechoslovakia splitting into the Czech Republic and Slovakia in 1993 some suppliers, for tyres, electrical equipment, chains and some other parts were all of a sudden foreign. Motokov, formerly the exclusive distributor for Babetta was now also foreign. It has to be said however that Motokov had already begun to loose its former role as a central automotive export company. Most producers wanted to go it alone and export themselves - without really first knowing how to do this and many times in breach of existing contracts with foreign importers. Via Motokov most of the Babetta's exports to the West were sold under the JAWA label, for which Motokov had the trading rights at that time. JAWA, now equally wanting to liberate itself from Motokov protested vehemently against the use of the Jawa name for the moped, arguing that the now poor quality of the Babetta was doing damage to the Jawa marque name. This caused the former friends and allies [JAWA and Babetta] into a period of confrontation, and this was to continued until Babetta agreed to stop using the JAWA label. It was during this period that sales started to slump considerably and it was then that the years of neglect of the production equipment began to show up quite dramatically. Lower sales caused a reduction in the workforce, and for long periods there was short time working, and even some temporary closure of the factory. This had a demoralising effect on the remaining workforce which in turn led to even more problems. Quality dropped to previously unseen levels and there had even been lorry loads of unusable moped sold to Germany whose engines seizing after only some 100 km of use. The reason for this poor quality was simple, tooling for the production of the crankcases was now so dilapidated that the openings for the crank bearings had been machined too small. 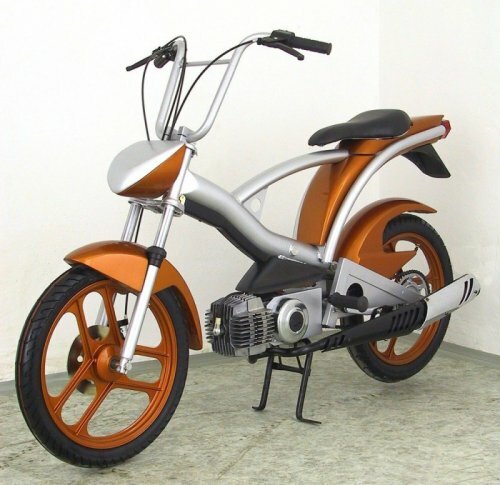 As if life for Babetta was not difficult enough, PS, who were now privatised and still producing small firearms and other military equipment, took the decision to restart moped production in co-operation with Piaggio, on a Puch licence. In 1994 the first bikes, named "Korado" left the small factory that was created inside the still huge PS. The contrast between the factories of Babetta and Korado were extreme. In Kolarovo there was old, 'clapped-out' equipment and a substantial lack of care from the staff. One could see engine case halves thrown on heaps before assembly, see workers hammering bearings into unheated engine casings without even looking, one could witness mopeds found to be faulty during final inspection, still being packed and sent off to the customer!! This was really shocking. In the small Korado factory however, equipped with Piaggio machinery there was care, order and cleanliness. I even saw workers in white shirts assembling engines. The quality of the Korado product is reflected not only by what one can see but also by its technical durability. Korado still produce machines, but due to a variety of other reasons have not managed to really get off the ground. It's a very complex story, perhaps to be told later. Babetta continued to struggled hard, but not hard enough. Even worse, it split. Its marketing department formed a separate company, Mopedy sro, owning some of the machinery and all sales contracts, whereas the production department which had become Babetta AS started to rival with Mopedy over customers, openly violating existing sales agreements - all to the detriment of the brand. After Germany dropped its legislation demanding pedals for small 25km/h mopeds and the Netherlands also introduced free school busses for children, exports to both markets dropped even more. After all, what youngster wants a pedal started bike? As more and more Taiwanese and other cheap but modem mopeds began to flow into the western markets, Babetta modified its engine to kick start. The new model of engine was the 225, looking very much the same as the 210, except for the starter mechanism. With this engine things became possible which had not been possible before and Babetta went on to explore new options. It made contact with a moped factory in Riga, Latvia. Riga was manufacturing a similar moped to the Babetta and it had a smaller bike, called the Stella that did sell relatively well, due to its low cost. It did however have a very poor engine. Riga needed engines and Kolarova needed Stella frames, the classical recipe for barter trade. Out came the Babetta 134. There were however problems right from the outset, as the quality from Riga factory was even worse than the one from Kolarovo. Babetta had to re-weld the frames they received as they tended to break. The 134 helped for a while to sell Babetta, but it could not stop the decline. In late 1997 the factory gates were to close for good and a long chapter of moped history had finally come to an end. Many, many Babetta moped however still roam the streets of the world, be it in Cuba, the US, South Africa, China or the many countries of Europe it had been exported to. May they continue to ride on for a long time, giving their riders both joy and in many cases a means of transport they would not otherwise have had. 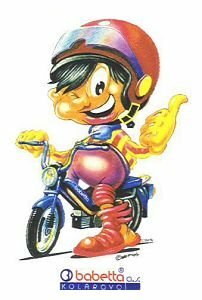 I for my part, whenever I see a Babetta, will always remember the place these mopeds came from, the town that had not even a hotel and only one small restaurant, and workers who as soon as the few Slovak managers were out of the hall started to converse in Hungarian. But what ever my last sorry impressions had been, I know that Babetta has written a proud 2-wheel history and I am glad that with this article I could share a little of that with you. Babettron have added some comments from one of their forum contributors, Mr. Zdena Matzker. This chap seems to take exception to some of Edgar’s comments and has written a point by point commentary on the original article. Many of his responses add useful additional information to the original, but others are just differences of opinion. Read for yourself (in Slovak) at the above website. Also on the “Babettron” Web site is another history article with information about the development of the various models as well as a lot of very interesting pictures of prototypes. 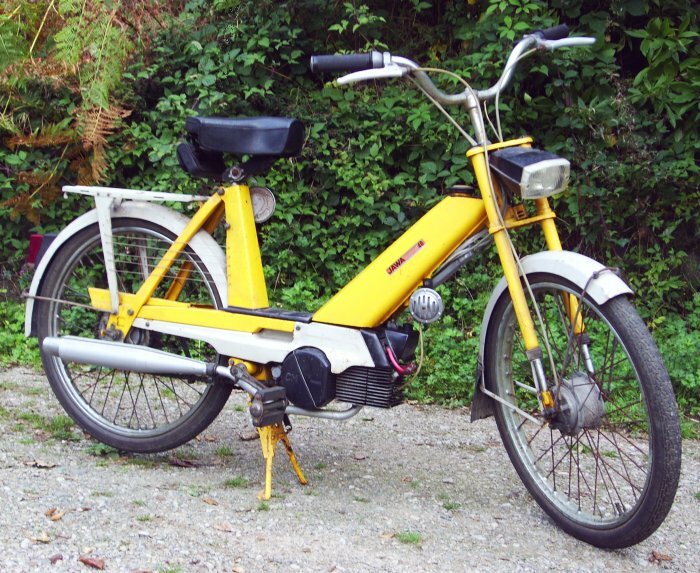 There are preproduction versions of the models that we are familiar with as well as models that never made it to production, like the 1973 electric powered moped based on the earlier model 207, and the stylish Manet Korado engined bike shown here. click on the picture to link to the article.